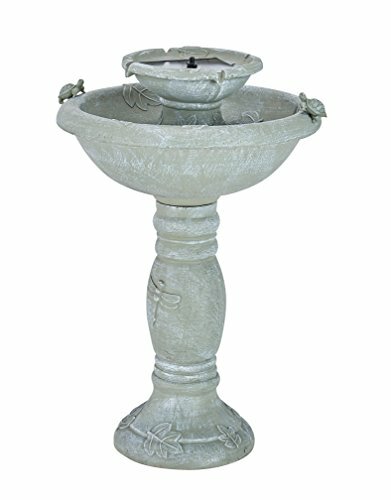 The Country Gardens 2-tier Solar-On-Demand Fountain is a relaxing and charming birdbath that features two turtles on the bowl's edge (removable if desired). This birdbath creates soft ambient sounds and adds an element of relaxation to any garden or outdoor area. The weathered stone finish is both elegant and versatile and can be incorporated beautifully in a variety of outdoor settings. Our patented Solar-On-Demand technology with integrated solar panel, pump and battery system offers standard day time use in direct sunlight as well as enabling night time use and/or consistent day time use during cloudy weather. Smart Solar: because you deserve the best. Smart Living Home & Garden offers a 1 year limited manufacturer’s warranty from the original date of purchase on full products bought from authorized distributors and retailers. Established in 2002, Smart Solar offers a wide selection of exclusively solar powered products. We design, manufacture, and customize all of our own items for your patio and garden. Enjoy our solar powered, energy efficient, and environmentally friendly lighting solutions, water features, and outdoor decor. We are confident you will love solar living - that's why we've been creating solar products and growing the solar lifestyle for nearly 15 years.